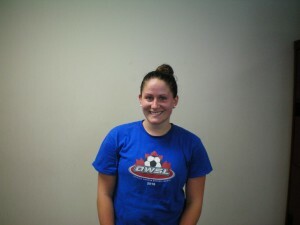 The 32nd – and 4th ever female – Member of the Soccer Fitness 20 MPH Club, Christina successfully completed 2 separate, 4-second runs at a speed of exactly 20 miles per hour on Thursday, August 4, 2011. A second year midfielder with the York University Women’s Varsity Soccer Team, Christina has been training with Soccer Fitness for the past two months. We are looking forward to continuing to work with Christina, and helping her to continue to improve her running speed throughout her university soccer career.